To change the thumbnail title go to the Options step, the Thumbnails tab. If you want to add any EXIF tag or any image file information to the thumbnails title you have to check the Custom text box in the Thumbnail title section. Now you can click the ... button next to the Custom text edit field to open the multi-line text editor. Here you can enter any text that will appear in the thumbnail title. You can use any HTML tags in this text if you want. 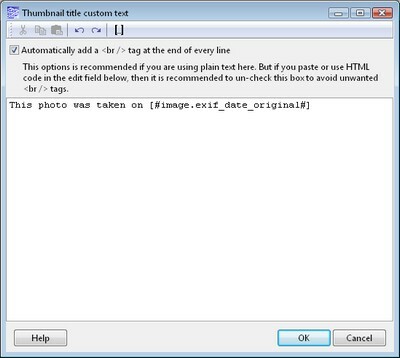 Now to add an EXIF tag or any image file information to the text of the thumbnail title click the button. 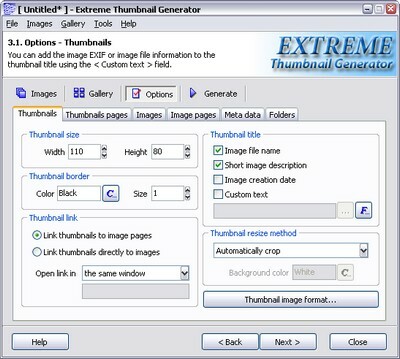 It opens the Insert special tag window where you can choose any image information you want.